The meeting takes place at the following address. Arrive early. 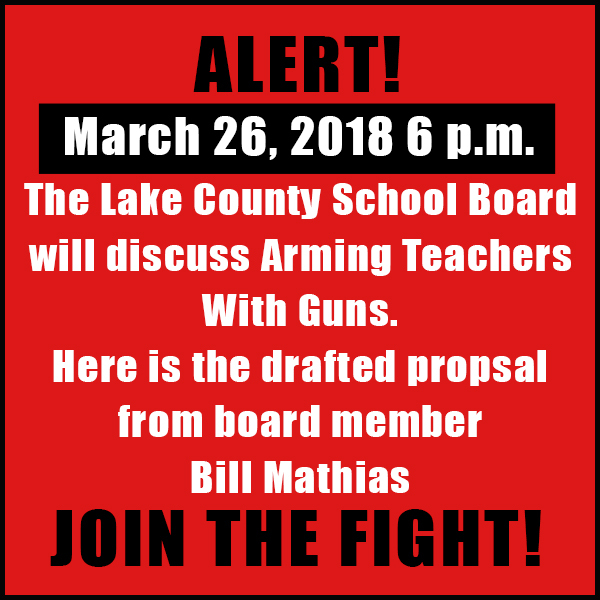 Please email the board members prior to the meeting and let them know how you feel about this. Parents and citizens MUST have their voices heard!!! • There were 6.4 incidents per year on average between 2000 and 2006. • There were 16.4 incidents per year on average between 2007 and 2013. 39 were in an education environment. the 107 incidents, the shooters fled the scene before law enforcement arrived. Schools in an effort to protect our kids. including criminal background checks, drug testing, and a psychological evaluation. authority in a law enforcement capacity off campus in any way. holsters and firearms will be used in the program. 10-20% more rounds fired for each participant. • Firearms: Precision Pistol / 16 hour block of instruction. • Active Shooter/Assailant: 8 hour block of instruction. • Defensive Tactics: 4 hour block of instruction. • Legal / High Liability: 20 hour block of instruction. • All training will be conducted by CJSTC-certified instructors. • Ongoing and annual proficiency retraining will be conducted by the LCSO. receive 8 hours of active shooter/assailant training (deputies receive 6 hours training). • A serious violation of the Lake County School District Employee Handbook/Policy. • Sentinel Program awareness training will be conducted for all SEU staff members. Sheriff’s Office outlining duties and responsibilities. District and the Lake County Sheriff’s Office.